This lovely building was carefully crafted by a robot, using automatic milling techniques. 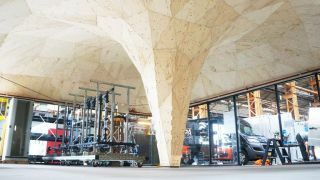 It's apparently the first robotically-fabricated building in the Netherlands, according to its designers Studio RAP. The 130-square-metre space was designed in a 3D modelling program, which yielded plans that involve 235 wooden panels. A robotic arm then carefully milled the panels out of wood, which were installed into a disused machine hall by humans. "The unique shape of the vault is distilled out of digital form-finding methods," said Wessel van Beerendonk, one of the three studio founders, in an interview with Dezeen. "This optimisation results in a compression-only roof structure. The vault rises up in a spectacular way from a central column that gradually blends into the roof construction in one smooth motion." He added: "Through digital fabrication, the architect can become a master builder, with increased control over the quality and integrity of the building in relation to the design intent."